Familiar thrills, but still a Star Wars footnote. The pace may be more slow-cooked and its tone may be bleaker than we're used to, but so much hits right on target and makes the force strong with this one. This is a passable action movie and that's about it. In clear rebellion from the Saga franchise, Edwards has taken Star Wars in a glorious new direction. I know that for the next few years, at least, I'll see fewer and fewer interesting, engaging, stories, and more and more interchangeable shells surrounding interchangeable explosions. 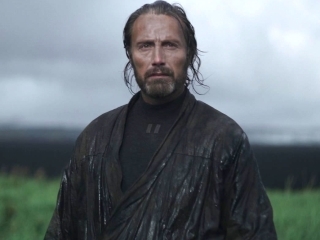 [Rogue One: A Star Wars Story] is a full and engaging addition to the Star Wars canon, the sort of striking cinematic experience that is reminiscent of the reasons we came to love the Star Wars in the first place. Edwards submits a distinct, though ultimately uneven work that never quite manages to become the spectacle or ensemble piece it hopes to be. Rogue One isn't a bad film, but it has some serious problems, which prevent it from being great. The truth is, what Rogue One truly succeeds at is repackaging a familiar experience so expertly that it feels unique. Chirrut's abilities borderline the trope of portraying disability as a superpower, but thankfully writers avoid offense by giving him a personality and character development that has nothing to do with his eyesight. This is the prequel we were looking for. Having people of all racial, cultural, and ethnic backgrounds gives Star Wars the legitimacy it needs as both a contemporary film in a multicultural world and as a space opera itself. An engrossing tale of war showing the hearts of those who fight it, fans of all ages are likely to find a resonant story worth telling. A truly worthy entry in the "[Wo]men on a mission" subgenre of war film, Rogue One roars triumphantly into theaters as one of the very best Star Wars films ever made. It may be the best suicide squad movie of 2016. As a piece of fan fiction, Rogue One neatly ties into the original movie in an impressive way. But as a piece of cinema, it is entirely inconsequential and no amount of impressive special effects can hide the fact that it is soul crushingly dull.